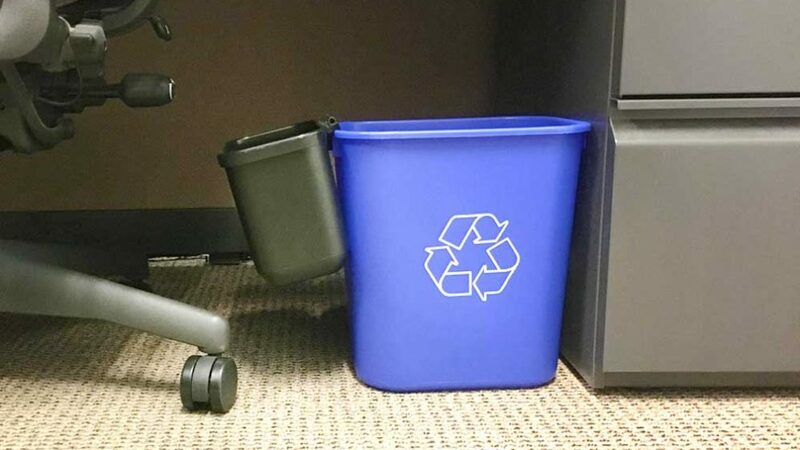 Mini landfill bins clip onto a full-size, deskside recycling bin. At University of North Carolina at Charlotte, use of mini-bins have increased recycling by 15 percent and save $13,000 annually by not needing to purchase plastic liners for waste bins. More than four pounds per day — that’s how much waste is generated by the average person living in the United States. Factor in that many of us spend half our weekday waking hours in an office building, and the potential magnitude of workplace waste begins to mount. But there’s at least one building on NC State’s campus where workplace waste is falling fast. In Administrative Services III, building occupants are piloting a new Zero Waste Workplace program as part of the university’s ongoing efforts to minimize waste sent to local landfills. 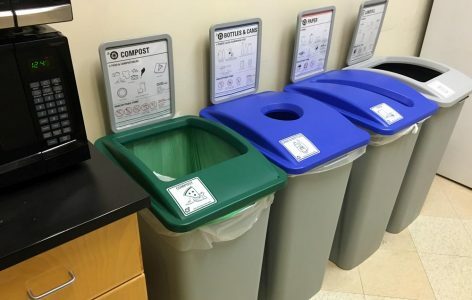 Coordinated by the university’s Office of Waste Reduction and Recycling, the Zero Waste Workplace program adds composting stations, replaces deskside trash cans with mini waste bins and adds additional self-service recycling and landfill sorting stations throughout the building. Currently, about 50 percent of waste generated on campus is diverted from landfills through reuse, recycling or composting. The Zero Waste Workplace program is designed to propel that rate toward 65 percent and beyond while also contributing toward cleaner, healthier facilities. “Use of a mini landfill bin, specifically, encourages users to take food and landfill items more frequently to convenience sites, which are emptied daily by University Housekeeping. This results in fewer opportunities for bugs and other pests to enter the workplace,” said waste reduction outreach coordinator Lani St. Hill. In strategic locations such as break rooms, Administrative Services III building occupants can compost material such as food waste, paper plates and napkins, coffee grounds and tea bags. There are even composting bins in restrooms for paper towels. One of the most significant drivers of waste reduction in a Zero Waste Workplace is the addition of collection bins for compostable material, which is processed into nutrient-rich soil amendment at a nearby composting facility. According to a 2015 campus waste characterization study, compostable material accounts for 38 percent of waste discarded at administrative and academic buildings. One reason Administrative Services III was selected for the first large-scale pilot program is because it’s home to University Housekeeping, the University Sustainability Office and other departments within the Facilities Division. St. Hill said the support of University Housekeeping and building occupants is the common denominator in all successful zero waste programs, which have also been implemented at Sullivan Shops III — where the Office of Waste Reduction and Recycling is based — and Talley Student Union, which offers mini-bins in offices and compost stations in the building’s food court. At Administrative Services III, the weights of landfill, compostable and recyclable material are being analyzed as are cost savings resulting from reduced weight-based tipping fees at the landfill, less frequent dumpster servicing and fewer purchases of plastic liners. Published in News, Uncategorized, Waste Reduction.